North Korean leader Kim Jong-Un complimented CIA Director Mike Pompeo for his “guts” during their recent meeting, a report said. Mike Pompeo reportedly held three to four separate meetings with Kim Jong-Un over Easter weekend. Pompeo, whose nomination for secretary of state was approved by the Senate Foreign Relations Committee on April 23, had a secret meeting with Kim in Pyongyang over Easter weekend. Kim reportedly expressed to Pompeo his intention to give up the North’s nuclear weapons program while not asking for the withdrawal of U.S. forces from South Korea. Kim also said he intends to free the three remaining U.S. detainees in North Korea, the report said. The report noted that Kim also expressed “joy” and “satisfaction” upon meeting Pompeo, who is known for a tough position on the North’s nuclear weapons program. 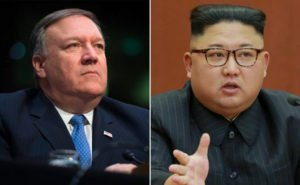 Pompeo had three to four separate meetings with the North Korean leader during his three-day, two-night stay in North Korea, the report said. Financial News reported that Kim will be given the highest welcome at his landmark summit with South Korean President Moon Jae-In on April 27. The welcome includes a ceremony, a state banquet and other gestures reserved for top guests. Seoul has yet to confirm whether North Korea’s first lady, Ri Sol-Ju, will be visiting, and has not ruled out the possibility, according to the report. Meanwhile, Pompeo’s nomination for secretary of state won approval from the Senate Foreign Relations Committee after Sen. Rand Paul flipped to endorse him. The CIA director is expected to be confirmed as secretary of state as soon as this week. Paul said he shifted his stance on Pompeo’s nomination after multiple conversations with President Donald Trump.